Nature lovers walking along the 4,200-foot Orono Bog Boardwalk first pass through a “lagg,” a natural drain channel where cinnamon ferns and skunk cabbages grow alongside the boardwalk. As a summer breeze stirs cotton grass growing alongside the Orono Bog Boardwalk, and songbirds flit among the stunted tamaracks, visitors might forget they’re exploring nature only 2 miles or so from the busy Bangor Mall. In fact, except for distant truck vibrations emanating from Interstate 95, visitors might forget how close civilization has encroached on the Orono Bog, a 616-acre tract that straddles the Bangor-Orono boundary. And a summer day is a good time to explore the bog, which comprises upland woods and peat land created by decomposing plants. The Orono Bog Boardwalk makes exploration possible. Declared a National Natural Landmark in 1974, the approximately 11,000-year-old Orono Bog became accessible to visitors after a 4,200-foot boardwalk was completed nine years ago. The boardwalk begins at a gate in Bangor City Forest, a 650-acre parcel that abuts the bog’s southwestern boundary. Located near the gate are a small cabin and an information kiosk. The boardwalk forms a single “closing” quotation mark, with its tail touching the gate. Visitors are encouraged to take their time exploring the bog; seven interpretive stations highlight specific natural and wildlife features, and scattered benches provide places to relax. The boardwalk initially crosses a “lagg,” a natural channel that drains bog runoff northwest toward Pushaw Lake. Visitors pass through a mixed forest dominated by hardwoods growing on the hummocks that jut from the forest floor. Look for balsam fir, black ash, northern white cedar, and red maple; also notice the tall cinnamon ferns and red-tinted skunk cabbages that thrive alongside the boardwalk. Softwoods — black spruce and tamarack, with some balsam firs — gradually dominate the forest closer to the actual peat bog. The boardwalk crosses an “upland island” created by upthrusting rock, then reaches a wooded heath where the dominant softwoods struggle to survive. Here the trees resemble dwarf species planted in urban landscapes. The Orono Bog’s version of the Venus flytrap, insect-eating pitcher plants abound at this point and elsewhere in the bog. The boardwalk emerges onto the central bog, where hummocks and depressions known as “moss lawns” dominate the terrain. Many plants and trees thrive in the acidic peat; look for grass pink and sheep laurel (these species share the color pink), the aptly named cotton grass on its green stalks, bladderwort, and sundew. The boardwalk turns northwest and crosses the central bog. Notice the black spruce growing on the hummocks; these trees reproduce by “layering,” which occurs when a tree’s ground-touching branches take root and grow new trees. Then the Orono Bog Boardwalk turns southwest and re-enters the mixed forest. For some distance various habitats intermingle, and the dominate softwoods vary in size, even among individual trees of the same species. Soon the boardwalk intersects itself; visitors can turn left toward the bog or turn right and walk to the gate. Although black bears and deer do appear in the Orono Bog’s forested sections, the more numerous mammals living there are red squirrels and snowshoe hares. Rodents — mice and voles — remain hidden on the tangled forest floor. Birds abound: look or listen for brown creepers, chickadees, hermit thrushes, Lincoln’s sparrow, Nashville warblers, red-breasted nuthatches, and white-throated sparrows. Among the amphibians living in the bog are leopard frogs, tree frogs, and wood frogs. The Orono Bog Boardwalk is open 7 a.m.-6:30 p.m., daily until Aug. 31, then 7:30-5:30 p.m., daily in September. There is no admission fee, but donations are accepted. Visitors can access the environmentally fragile Orono Bog via the adjacent Bangor City Forest. From the Bangor Mall, drive north approximately 1.3 miles on Stillwater Avenue, turn left at Tripp Drive (last turnoff before the Veazie town line), and follow the signs. Use either the gravel parking lot — often busy on sunny days — or pull off at the far edges of the asphalt cul-de-sac. 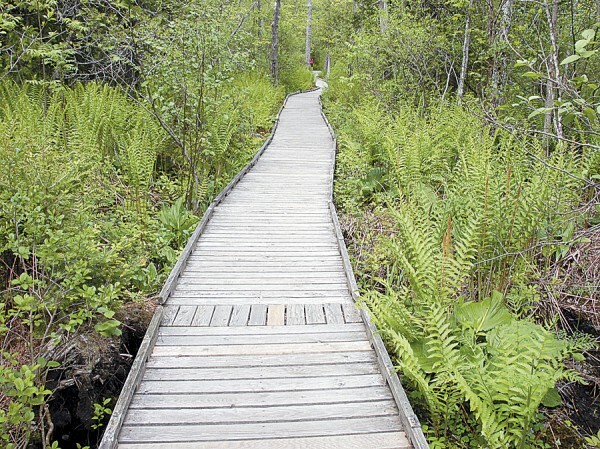 To avoid damaging the environmentally fragile Orono Bog, stay on the boardwalk. For more information about the Orono Bog Boardwalk, log onto www.oronobogwalk.org. For a printable boardwalk map, log onto http://www.oronobogwalk.org/images/Board10003rev.gif.